Part 11: Welcome to Hong Kong! | Nam Writes. Part 11: Welcome to Hong Kong! 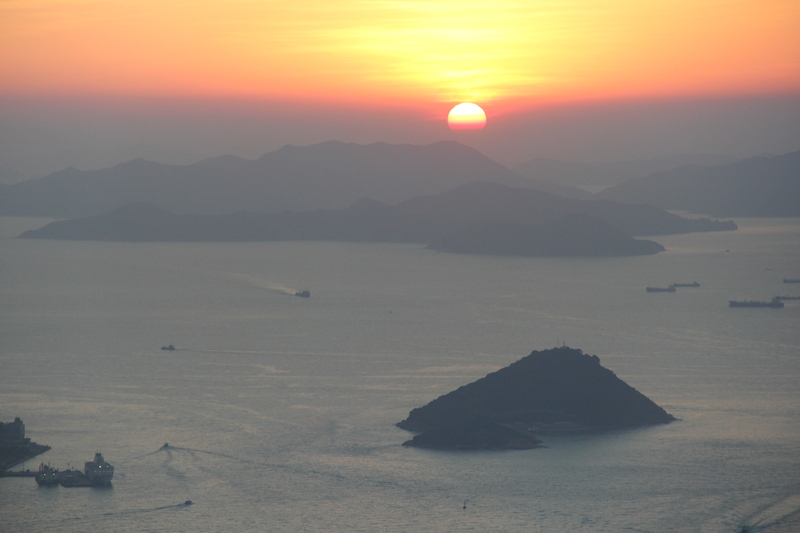 It’s been a while since I wrote about the Great Asia Trip of 2013, stopping before I got to my favorite part. 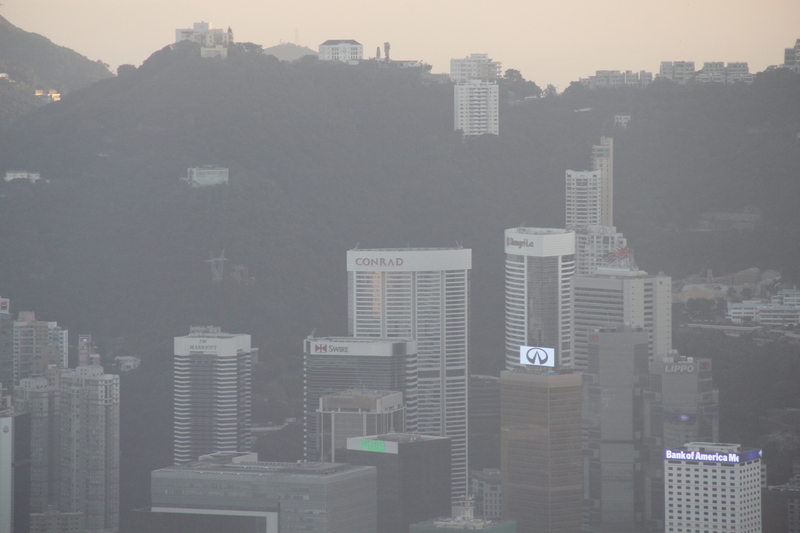 So without further ado, my new favorite city in the word: Hong Kong. I loved Hong Kong. Why? In sum, it is a cleaner, more efficient, more beautiful, slightly cheaper (but not much) version of New York City. But it is also so much more than that. I loved everything, from the towering skyline mixing with the mountains, to the lights glimmering on the harbor, to the insane number of shopping malls, to the weather (70 degrees in December! )…I could go on and on. 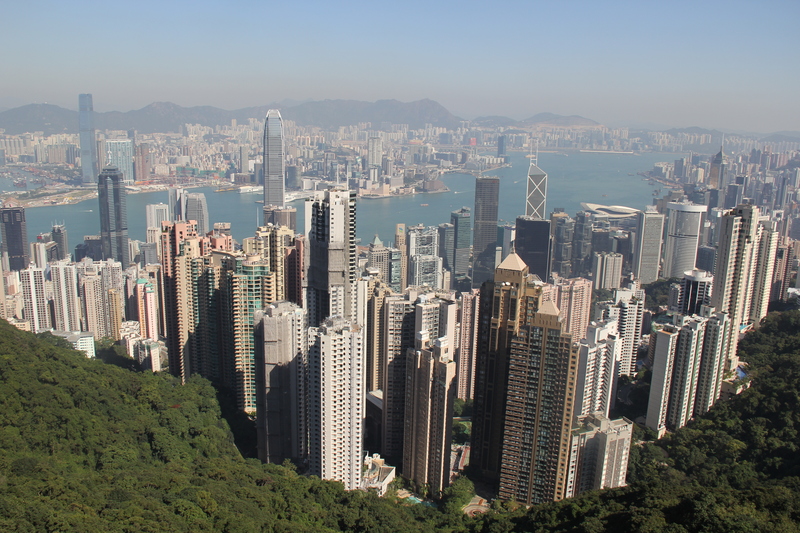 Our first day in Hong Kong, we did the classic tourist attractions. 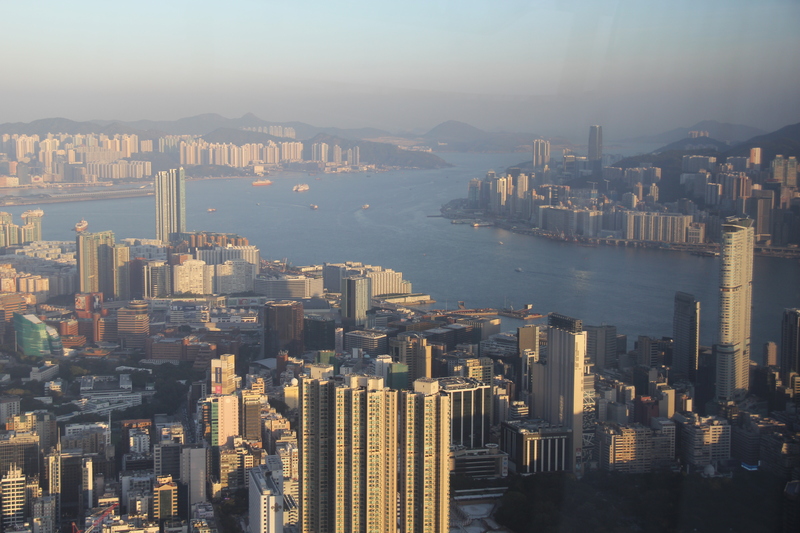 But unlike most tacky tourist activities, going to the Peak and taking the Star Ferry across Victoria Harbor allows you to really appreciate the beauty that is Hong Kong. First up: The Peak. 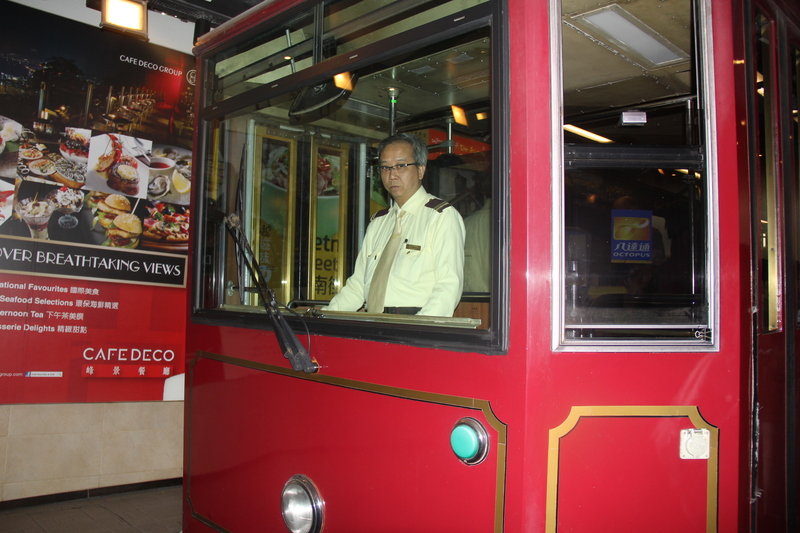 We rode the somewhat overpriced tram up to the Peak, which you should do once in your life. We actually walked down on the way back, but that was more of an accident than a planned activity. 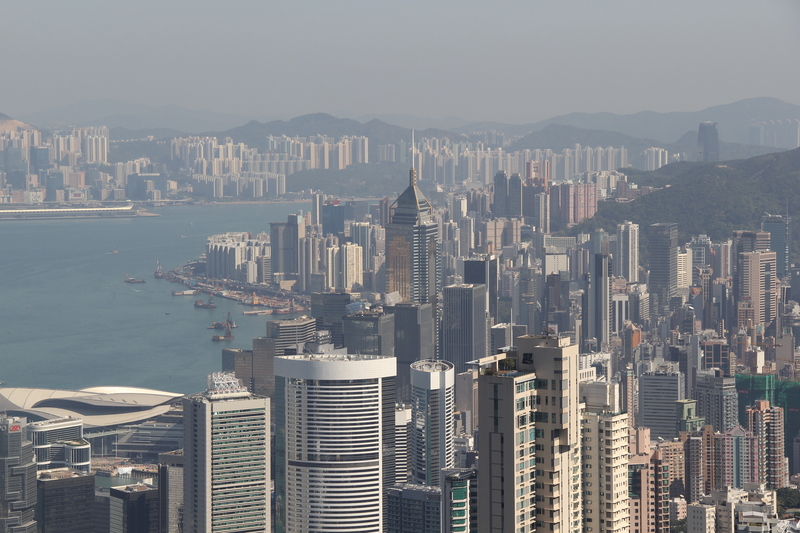 If you are even a little bit obsessed with tall buildings (guilty), then the Peak is a great place to learn about Hong Kong’s skyline. And I highly recommend annoying people with your newfound knowledge after the fact. 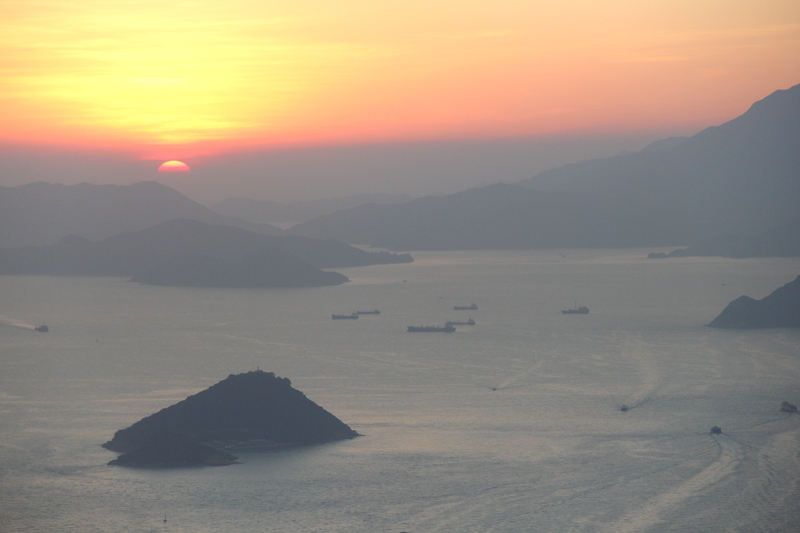 Here I am looking eastward and north across Victoria Harbor. 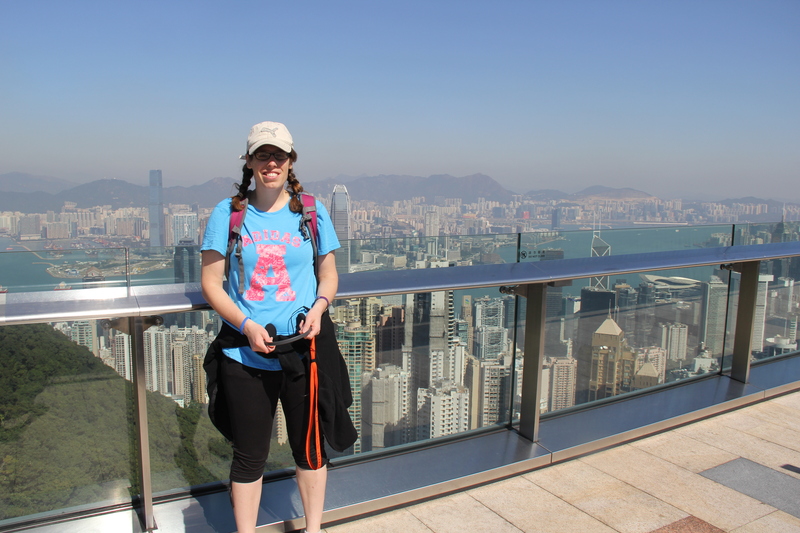 Me at the top of the Peak – and look – it’s short-sleeve weather! And finally, here is the bizarre but famous Peak Tower, where you’ll find restaurants, gift shops and a variety of other tourist activities. 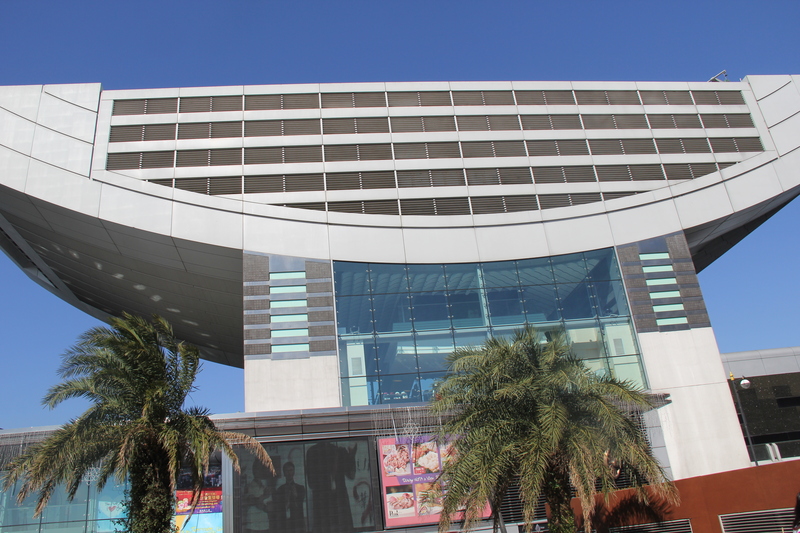 The Sky Terrace 428 is located at the very top. After I took a bagillion (not a typo) pictures, we went for a stroll that ended up being a hike down from the Peak to the south end of Honk Kong Island. We were technically lost. 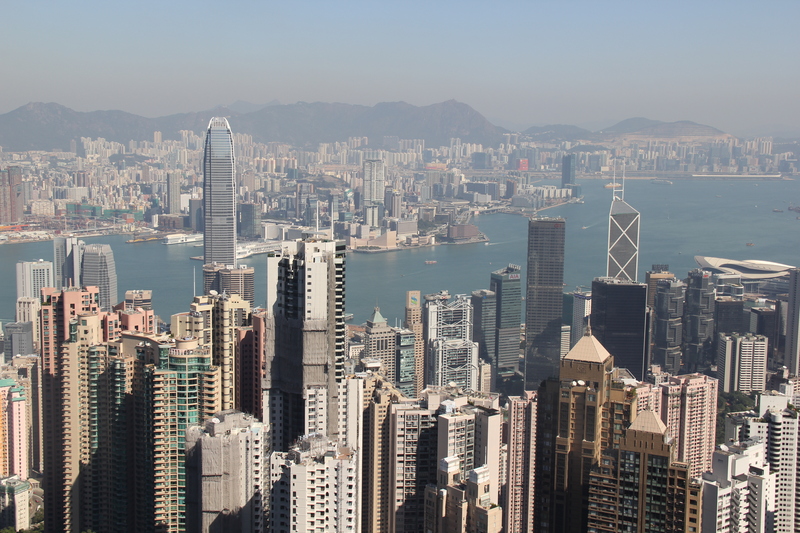 But here’s the wonderful thing about Honk Kong: We simply hailed a cab and 20 minutes later, we got to experience Hong Kong traffic and were dropped off at the Star Ferry terminal. 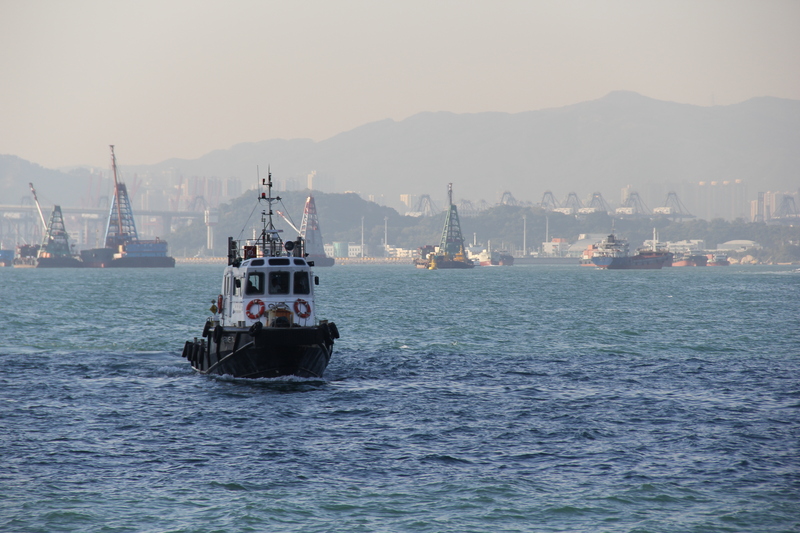 There are a number of ways to get across Victoria Harbor to Kowloon. 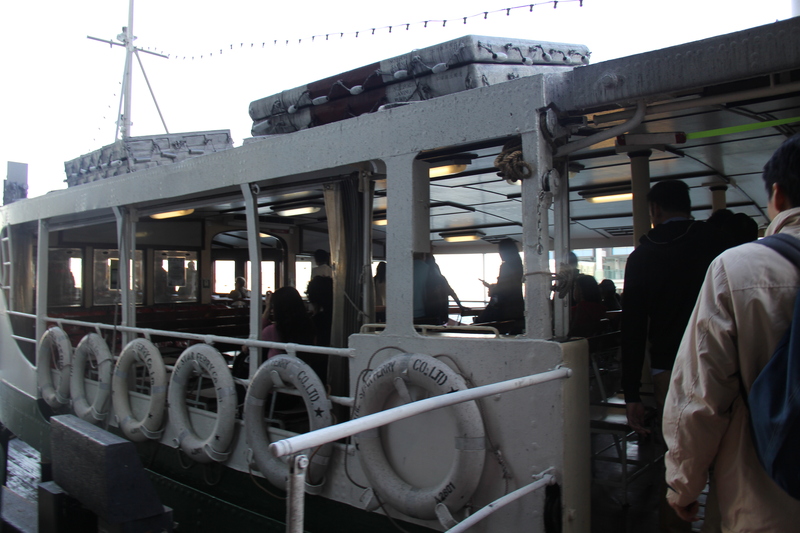 But taking the Star Ferry across the harbor is a quintessential experience. 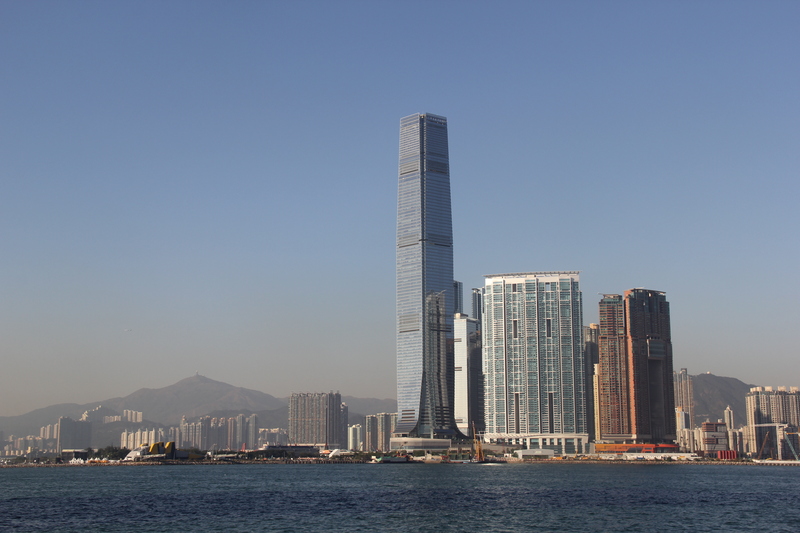 Below is the view of the International Commerce Center (ICC) from the ferry, the tallest building in Hong Kong, the seventh tallest in the world, and our next stop. ICC hosts an observation deck on the 100th floor. 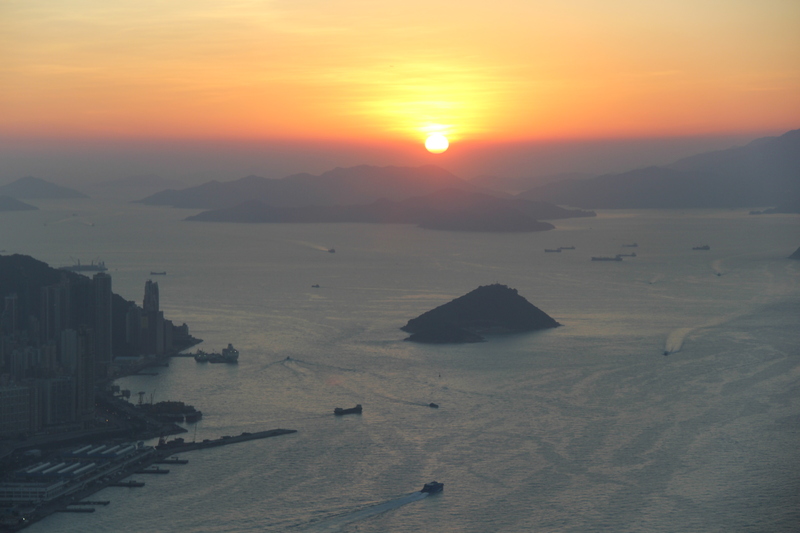 We timed our visit shortly before sunset to experience the view of Hong Kong in the daylight, at sunset, and at night. The view from the top of ICC is amazing. My only caveat, as a photographer, is the observation deck is fully enclosed, so if you are looking for great photos, you will have to contentdwith the glass reflections. Still, I managed to get a couple of decent photos, especially of the sun setting into the water with a spectacular display of colors that took my breath away. We could see our hotel (the Conrad) from the ICC! 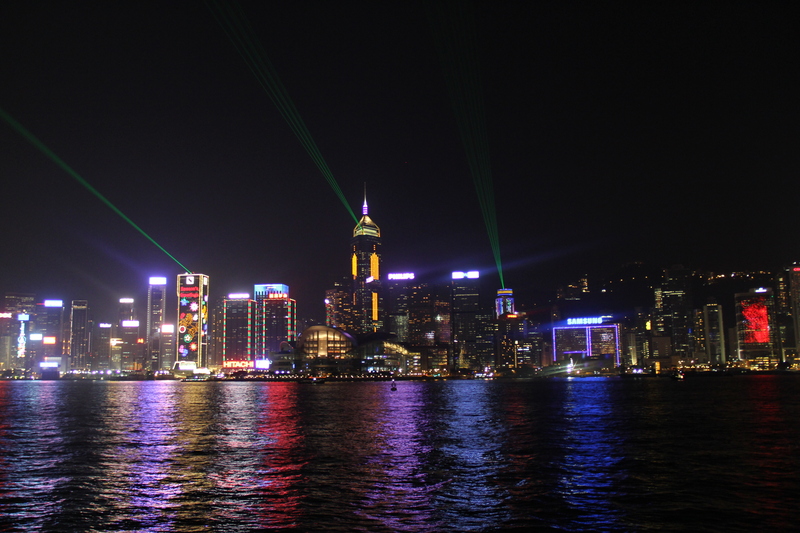 Our last activity for the night was Hong Kong’s famous light show, which happens at 8:00 pm every night and is best seen from Kowloon side of the harbor. I admit, I was a little underwhelmed. Perhaps it was because the rest of the day was so amazing. Or maybe I was just tired and hungry (definitely a possibility since it was already 8 pm and my jet-lagged bed time fell in the 5:00 – 6:00 pm slot). 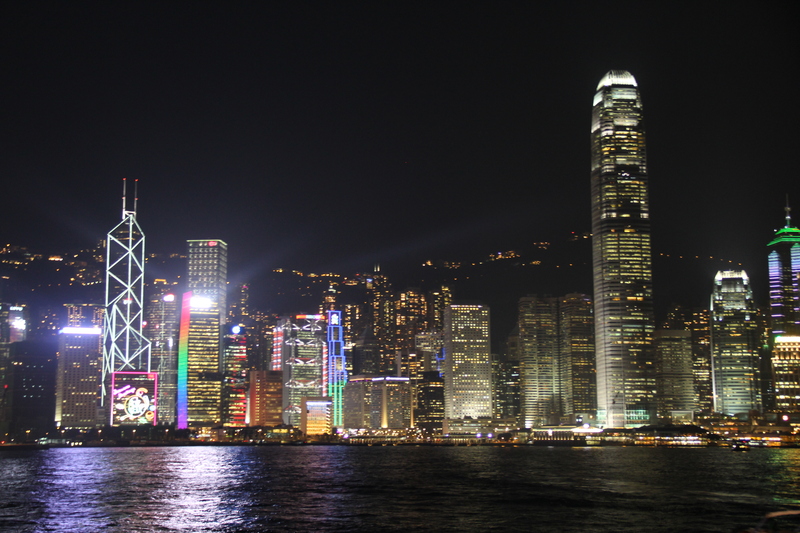 Don’t get me wrong: I loved Hong Kong at night. The city’s lights put New York City to shame with its palette of colors and imagery. But in my book, the 20 minute light show is more of a one-time activity. Our first day in Hong Kong was AMAZING. I was exhausted, but I was also in love. drive the message home a bit, but instead of that, this is fantastic blog. Howdy! This blog post could nnot be written any better! Looking at this post reminds me off my previous roommate! He constantly kept talkng about this. I’ll send this article to him. Pretty sure he’ll have a very good read. Manyy thanks for sharing! my web site!I suppose its ook to use a few of ylur ideas!! provider at a reasonable price? Kudos, I appreciate it! your writing. I am confident, you have a great readers’ base already! Just want to say your article is as astounding. The clarity to your submit is just excellent and i can suppose you’re knowledgeable in this subject. post. Thanks one million and please continue the gratifying work. •Speed up: If you have created a speedy decision of giving the CASC test then you most definitely should get ready close to possible. to investing it haphazardly. Fabrication operates are performed on all sorts of Stainless-steel Bedding, G.